Neon Trees today announced their next tour “An Intimate Night Out With Neon Trees” will kick off June 6th in Seattle, WA at the Showbox and cross the country before winding down on July 25th in Boston, MA at Paradise Rock Club. A full list of tour dates can be found below. Neon Trees – comprising Tyler Glenn (lead vocals, keys), Chris Allen (guitars), Branden Campbell (bass), and Elaine Bradley (drums, vocals) – released their third album Pop Psychology on April 22, 2014. 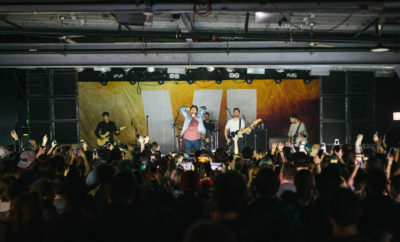 The album, recorded in Cabo San Lucas, Mexico, Los Angeles, CA, and their hometown of Provo, UT with longtime collaborator Tim Pagnotta spawned the RIAA Gold-certified single “Sleeping With A Friend,” which won an award for BMI Publishing Award in 2014 and charted in the Top 15 of the Billboard Hot 100. It is available HERE. Pop Psychology is the follow up to Picture Show, which featured the RIAA double platinum single “Everybody Talks,” which charted in the Top 10 of the Billboard Hot 100. Neon Trees’ debut album, Habits, was released in 2010 and featured the double platinum smash single “Animal.” The band has toured with Taylor Swift, The Killers, Maroon 5, Duran Duran, Flaming Lips, My Chemical Romance, and more. ← Previous Story Next Round of ACM Award Performers Announced! !